Ohh yeah, this is happening. 5 untrieds in 1 post. 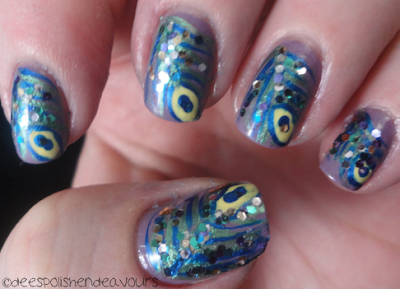 As I write this, I keep looking at these nails - because to me, in real life, they look amazing! Yet when I was looking through the photos, it looked kind of.. not amazing. It all started the night before. I could have been a day ahead with posts.. But.. I had just painted my nails with Celestial, and topped it with Pet My Peacock. It was just sort of.. blah. 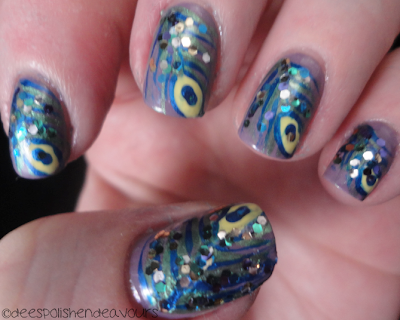 Then I was like 'why not peacock feather nails?!'.. then I hit the internet for inspiration photos. I stumbled across this POST - and I knew I had colours to match.. and they all happened to be untried. YESSSSSS!! Started with My Kind of Cool Aid.. Then I did some "feathering" with Big Money Frost (thankies Danielle! ), then I used Unicorn (thankies Des!! )((edit: whoops, apparently I have used this gem once before.. well then..)), then some Celestial activity (thankies Collette!).. Then I just felt it wasn't finished.. It needed some pizazz.. So Pet My Peacock came in to play.. (thankies again to Des!!).. Again, I feel the photos don't do this any justice.. But I think it looks rad.. Eh, you win some and you lose some. I won this round.. my camera makes it almost feel like a loss. Merp! Take care everyone - see you for day 13! And remember to go see what Silver posted up for today! !